trials continued with a limited overs game at the Everest Cricket Club yesterday. Chanderpaul Hemraj stroked three fours and a similar number of sixes in a top score of 55 from 52 balls as Barnwell XI posted 212-8 before they were bowled out in 36.4 overs, batting first. 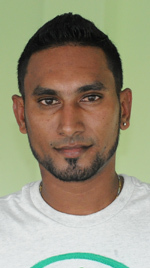 Hemraj added 51 for the third wicket with Shemroy Barrington and 49 for the fourth wicket with Jeetendra Sookdeo. Barrington faced 48 balls and hit two fours and two sixes before he was dismissed for 40, while Sookdeo hit one four and a six in his 24. Left handed opener Robin Bacchus scored 26 of 28 balls with six fours and put together 36 for the second wicket with Barrington after their team lost an early wicket. Pacer Paul Wintz was the pick of the bowlers with 4-39, while Raj Nanan claimed 2-31 and Seon Daniels 2-32. Off spinner Yatesh Dhanpaul grabbed 5-13 as Johnson XI were sent packing for 83 in 22.3 overs in reply. Bacchus captured 3-13 and Antonell Atwell 2-14. Kamesh Yadram was the leading batsman with 21; Daniel Seegobin made 17 and Rajendra Chandrika 13.